Bengaluru: Fortis Hospitals, Bengaluru, on the occasion of World Head Injury day, 20th March, took an initiative to promote use of helmets while riding. In association with Bangalore Traffic Police, three days drive started on Friday March 17 and will end on Monday, March 20 conducted on various signals of Jayanagar 4th block, Cunningham Road, Nayandahalli, JP Nagar, Gopalan Mall, Inner Ring Road, Outer Ring Road and Rajajinagar. 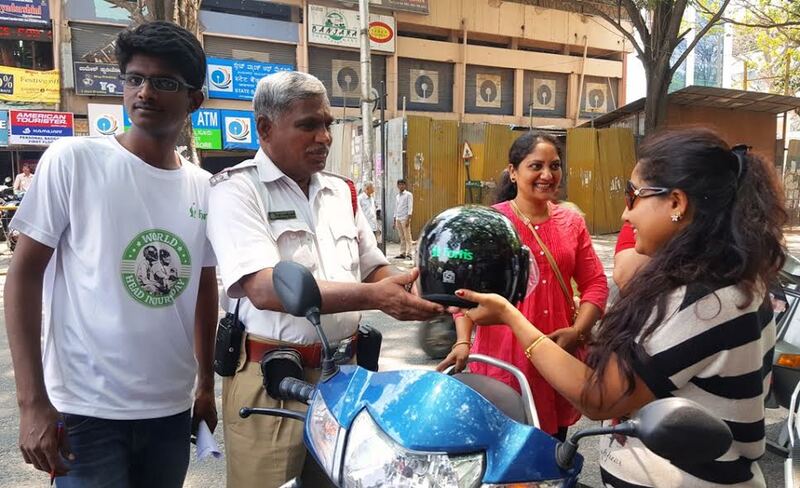 Traffic police at the signals gave away the helmets along with the pink slips to the people who were seen without wearing a helmet. The aim of the initiative is to raise awareness on the importance of using helmets while riding to ensure minimal damage in case of accidents. According to World Health Organisation, 1.25 million people lose their life to road traffic crashes every year. WHO also states that In Karnataka there is about 42 million registered vehicles, of which 71% are motorized two-wheelers. The state capital, Bangalore, has 2 million registered vehicles, 75% of which are two-wheelers. Injuries to the head and neck are the main cause of death according to the survey. Fortis Hospitals Bangalore has been taking several initiatives to spread awareness on safety regarding various healthcare issues in India.